Chaos came roughly 75 minutes in, despite police efforts to keep apart a couple of hundred protesters who far outnumbered the Patriot Prayer and pro-Donald Trump crowd. Those protesters came to denounce the president and promote anti-capitalist or pro-civil-rights themes. 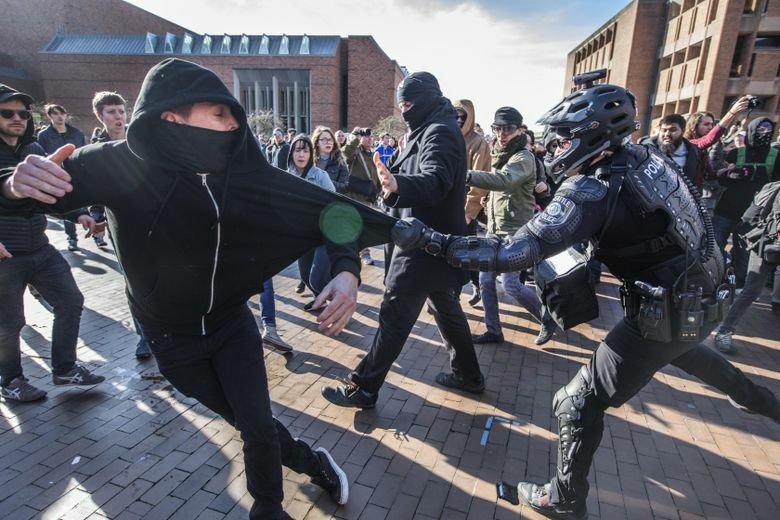 Five people were arrested, American flags burned and police officers used bicycle barricades and pepper spray to separate demonstrators at the University of Washington’s Red Square on Saturday during a much-anticipated rally called by supporters of President Donald Trump and others who said they aimed to promote free speech. 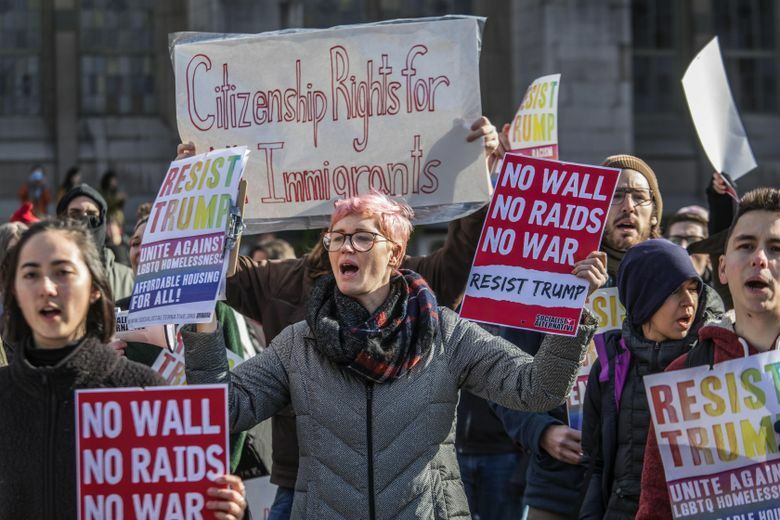 The rally — led by leaders of the College Republicans and their guests, the right-leaning Patriot Prayer, based in Vancouver, Washington — was peaceful early on. The chaos came roughly 75 minutes in, despite officers’ efforts to keep at a distance a couple of hundred protesters who far outnumbered the pro-Trump crowd. Those protesters came to denounce the president and promote a variety of anti-capitalist or pro-civil-rights themes. People supporting the Patriot Prayer gathering broke out in chants of “USA! USA! USA!” with signs including, “We died for liberty not socialism.” A few held yellow “Don’t Tread on Me” flags. At least one person wore a Proud Boys T-shirt in support of the far-right men’s group. Wearing a Make America Great Again hat, College Republicans President Chevy Swanson said the goal Saturday was to create a space for campus conservatives to share their values and promote their free-speech rights. Lines of waist-high metal barriers and UW and Seattle police officers separated the politically opposed groups. Officers were in riot gear. At one point, people with the Patriot Prayer gathering exited their sectioned-off area of Red Square — where leaders gave speeches and performed music — to walk into the opposing crowd. Swearing, spitting, shouting and fighting followed. “They were pretty belligerent, but I wouldn’t say I wasn’t either,” said Mikaele Baker, 20, a UW sophomore and self-described anti-fascist, referencing those supporting the Patriot Prayer rally. His glasses helped protect his eyes from pepper spray. Tia Chicome traveled from her home on the Yakama Reservation. She carried a flag that meshed designs of the American and Mexican flags. Ron Theis said he was a veteran, too. Twenty-three years, he said. In town from Oklahoma City to visit family, Theis said he came to the rally to show support for Trump’s approach to funding the military. “l’m showing support for the patriotic way of life,” he said. For weeks, the UW was in talks with rally organizers to ensure safety. The potential for violence worried authorities, especially given the shooting in January 2017 in Red Square, after right-wing firebrand Milo Yiannopoulos spoke at the UW at the invitation of the College Republicans. On Saturday, the police effort to keep groups apart was clear — a tactic not fully seen at the Yiannopoulos event. Police did not provide details Saturday about the five arrests. 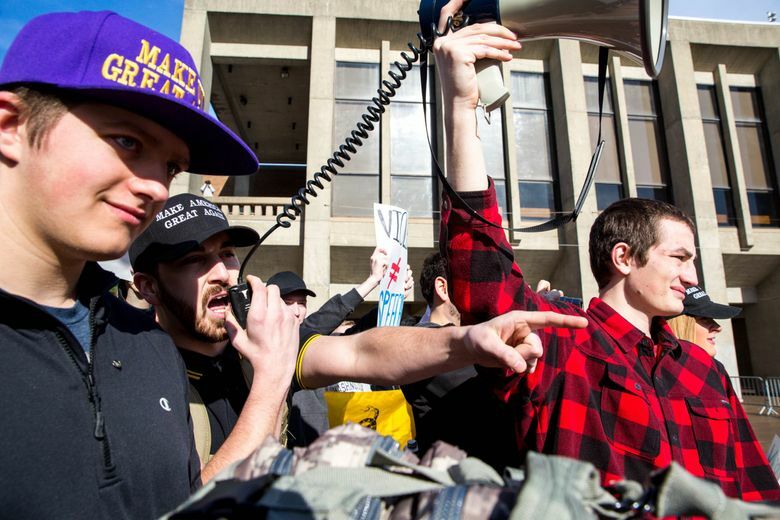 A federal judge Friday blocked the UW from billing the College Republicans an estimated $17,000 security fee for the rally on the grounds that doing so would violate free-speech rights. Material from The Seattle Times archives was included.